Bibimbap (mixed rice in Korean) is a composition of rice and vegetables and marinated meat or tofu. Korean people were used to eating the remains of offerings by mixing cooked rice with sautéed vegetables. All the ingredients were thus put together in a large bowl and then seasoned with a little sesame oil and various condiments; including gochujang paste (Korean fermented condiment spicy red peppers, soybeans, glutinous rice flour and wheat germ). 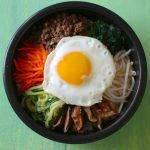 What is the history of bibimbap? During the Joseon Dynasty, who ruled between the end of the 14th and the beginning of the 20th century, bibimbap was called goldongban. The name of bibimbap is first mentioned in the Siuijeonseo, an anonymous Cookbook dating from the end of the 19th century. 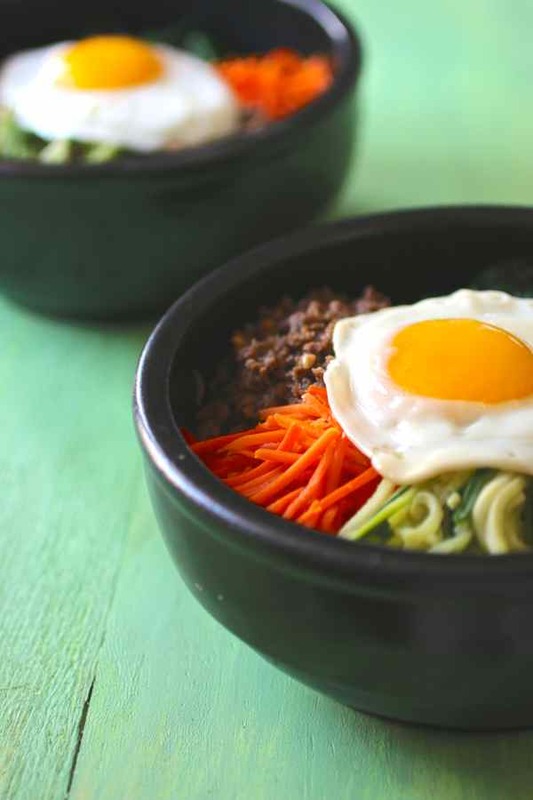 The variation of bibimbap called ‘dolsot bibimbap’ is served in a very hot stone bowl at the bottom of which is placed the rice with vegetables and meat atop. It is often covered with a raw or sunny-side up egg. The bowl is traditionally placed on a wooden base and served at the table this way. The city of Jeonju, the capital of the Jeolla province is known for its version of the bibimbap. Dolsot bibimbap is a delicious and colorful traditional Korean rice dish with meat and vegetables, that is cooked in a hot stone bowl. 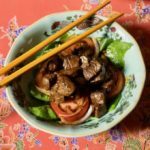 Mix meat in ¼ cup of soy sauce, a teaspoon of black pepper, 1 tablespoon of sugar, 6 cloves of minced garlic, 1 small chopped onion, ¼ cup of cooking wine (or water), 1 tablespoon of sesame oil. Marinate for at least three hours. Then sauté for a few minutes in a pan. Wash spinach bunches thoroughly and separate the leaves. Blanch the leaves in boiling water for one minute. Drain by taking a few sheets at a time and have in a mol. Add the soy sauce, chopped garlic, sesame oil, a dash of salt and sugar. 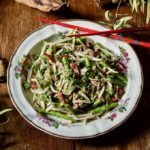 Operate the same way (separately) for the beansprouts and broccoli. 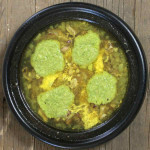 Arrange the beansprouts (broccoli) in a saucepan with ¼ cup of water. Add a little salt. Cover and boil for 2 minutes over medium heat. Set aside and cool. Drain, place in a bowl and toss with chopped garlic, salt, toasted sesame seeds and sesame oil. Operate the same way (separately) for carrots and zucchini. Cut carrots (zucchini) in fine Julienne (match sticks) with a chef knife or mandolin. Season with rice vinegar. Sauté in sesame oil for a few minutes. Add a tablespoon of sugar at the end of the cooking. Cut the mushrooms into thin slices. Sauté in sesame oil until they are tender. Season with soy sauce, sugar and a dash of pepper. Cook an egg sunny-side up separately and place it on the bibimbap at serving time. 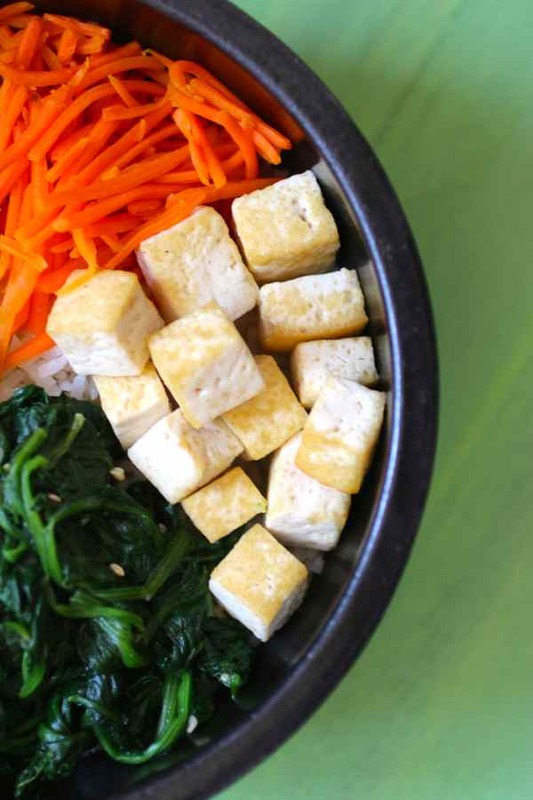 For a vegetarian dolsot bibimbap, replace the meat by tofu. I use extra firm tofu. To prepare it, you need to first drain it. Then, wrap it with a clean towel or paper towels. Place tofu on a board and apply pressure with a weight above. Let stand for at least one hour. 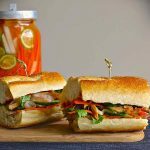 This operation allows removing any moisture from the tofu to make it denser and ease the frying. Cut the tofu into half-inch (about 1 cm) cubes. Sauté in vegetable oil for few minutes on each side. 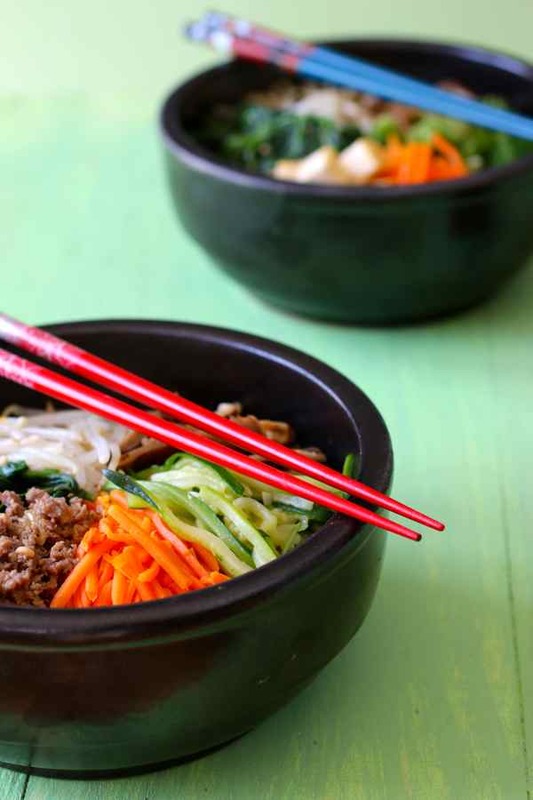 The bibimbap can be served in a regular bowl. In this case, all ingredients must be hot at time of serving. For a dolsot bibimbap (stone bowl), place the dolsot on direct heat (gas). Pour a little sesame oil at the bottom of the bowl and swirl to coat the sides of the bowl. 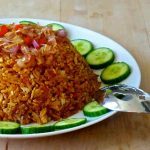 Pack the rice at the bottom of the bowl and wait a few minutes until the rice begins to sizzle. At this point, place vegetables and meat (or tofu) on rice all around bowl. Then place the egg on top and continue to cook a few more minutes. Place the dolsot on its wooden base and bring to table. 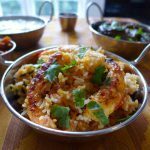 The bibimbap should be topped with a good spoonful of Gochujang paste, a little sesame oil and soy sauce. Before eating, stir all the ingredients with a spoon. I appreciate your appreciation of world cuisines, but I need to point out that Koreans would NEVER eat this dish with chopsticks. It is only eaten with a spoon. You may use chopsticks to eat banchan (small side dishes and pickles), but traditionally rice is eaten with a spoon, particularly a dish like this. (This comment is in reference to your photo). Thanks a lot Ruth. Really appreciate the correction here. We strive to be as authentic as possible, so these comments are very important!